Spend ten minutes prepping tonight’s dinner. 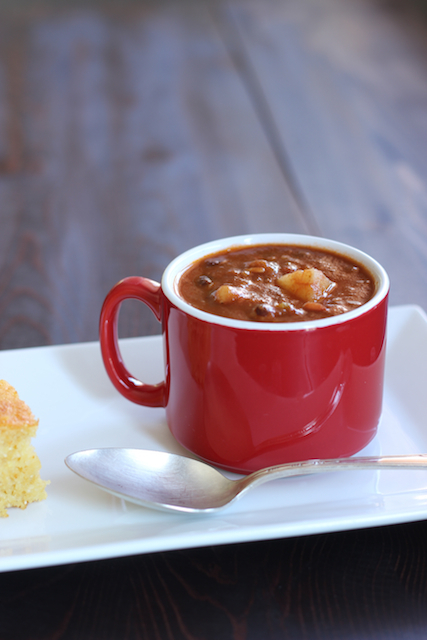 This crockpot chili bean soup is a crowd-pleaser. Things are starting to heat up now that April is well under way. I got a bit of a sunburn at Legoland earlier this week. Summer approaches! 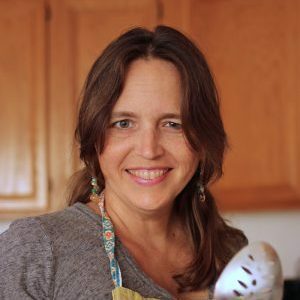 Warm weather aside, I still have been firing up the crockpot, particularly for those days when we need to be out and about, or when I don’t have time to mess in the kitchen. 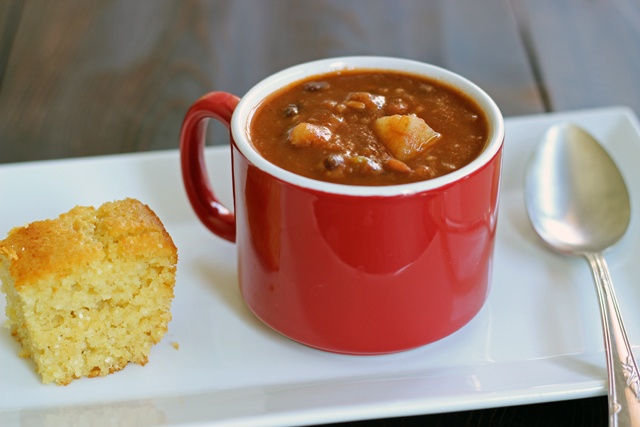 This chili/soup is packed with flavor, is easy to throw in the slow cooker before you head out, and it tastes great. This past weekend in between hockey games and errands, I served it with a rich honey cornbread (recipe coming next week) and some cut-up veggies on the side. Some of the fam dolloped it with Greek yogurt; but you could use sour cream as well. It makes for a simple and filling supper that won’t break the bank. You can make this more like a chili by adding more beans. My family isn’t super big on broth soups, this has just the right texture to please the masses, I think. Bonus is that is uses regular pantry staples and can be frozen for another time. Make a double batch and freeze half so you have easy lunches and dinners in the busy weeks ahead. In a large skillet, brown the turkey and onions until the meat is cooked and the onions go clear. Add the chiles and taco seasoning. Transfer this mixture to a 5-quart slow cooker. Add the water, tomato sauce, hominy, beans, and potatoes. Stir gently to combine. Cook on HIGH for 4 hours or on LOW for 6 to 8 hours. Cool, label, and freeze for up to 2 months. 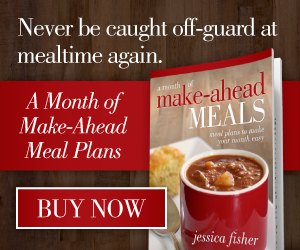 Make-ahead meals can make your month! 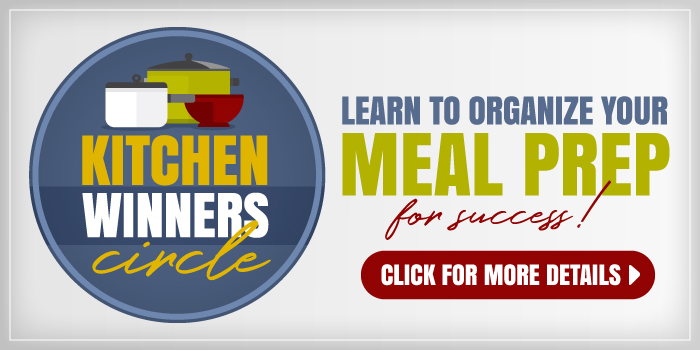 Grab this month’s meal plans to take it easy and enjoy great home-cooked meals. Just wanted to say I loved you on Coffee Table Conversations (even though you didn’t sound like I thought you would, lol). That was a great show. Loved that bundle from start to finish. Have a great weekend, Jessica. Well, now I’m curious what you expected. 🙂 Stephanie had warned me I’d need to be pushy to get a word in edgewise, but I think I was too pushy. So glad you enjoyed the bundle. That’s great to hear! It was great and one I plan to listen to again. That is funny. A smoker’s voice, eh? LOL! What is the purpose for the potatoes? To thicken the soup perhaps? I love and follow both of your blogs faithfully! Thank you for all the wonderful recipes! It does thicken it, but I add them to stretch it with an inexpensive starch. G’day! Nothing like chili on a warm winter’s day! Hey there ~ just wondering if there is a link the taco seasoning recipe or if I’m blind today. Sounds like a great soup for any weather! You’re not blind; I’m just forgetful. Here’s the link: http://lifeasmom.com/2010/04/pinto-beans-taco-meat-and-roasted-garlic-mashed-potatoes.html The post is corrected. Thanks for the catch! 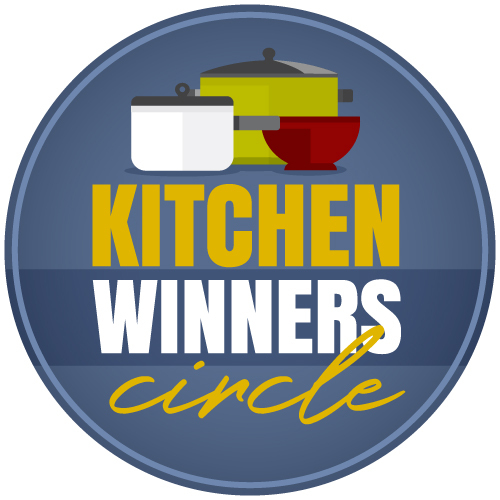 Awesome ~ thanks for the quick response and great recipes! Looking forward to trying this very soon! Usually get it at Walmart or Ralphs. It’s in the vegetable aisle. I only have a 1.5 quart cooker. How much would I cut down these measurements to make a couple servings in my cooker? Is that the really small one? Like really small? I guess I would do one can of beans, and 1/4 the rest of the ingredients?